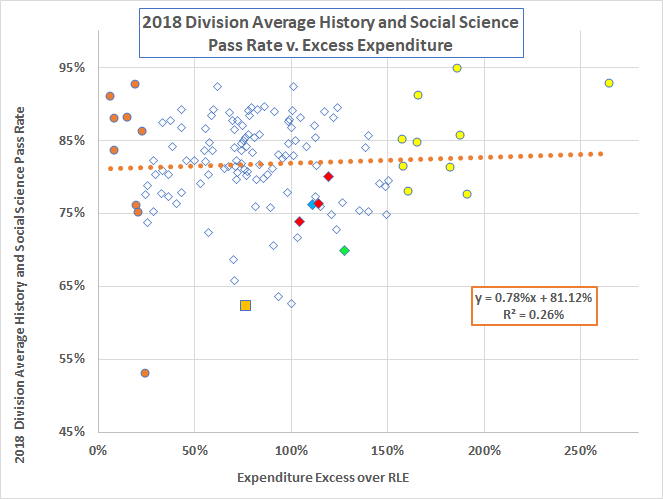 A helpful reader points out that the 2018 Required Local Effort report is up on the Web. Va. Code § 22.1-97 requires an annual report showing whether each school division had provided the annual expenditure required by the Standards of Quality. 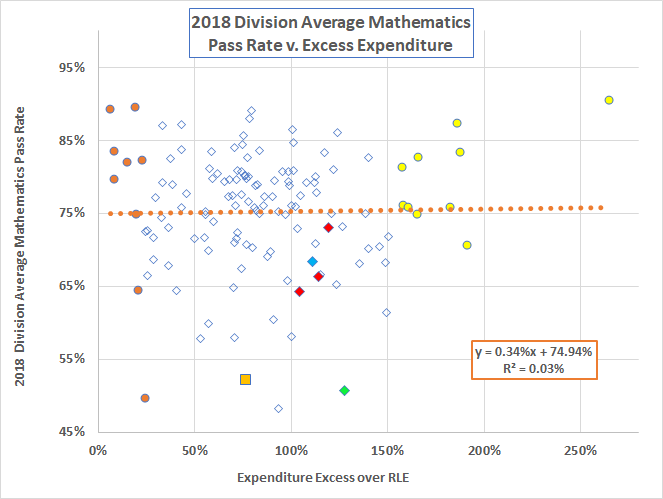 The report presents the data as “required local effort” (“RLE”) per school division, along with the actual expenditure, both in dollars and as the excess above the RLE. 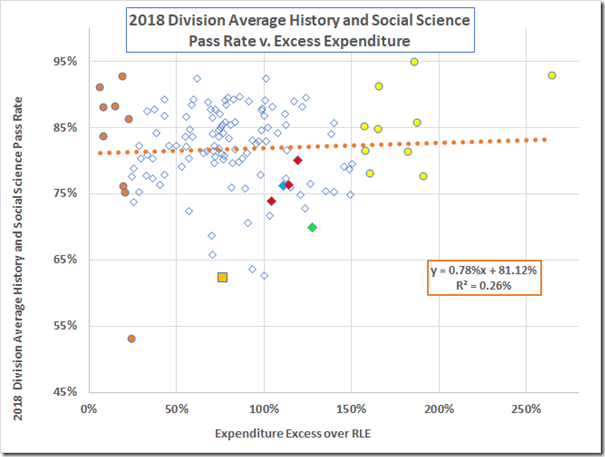 Note: The report breaks out the data for all divisions but the SOL database consolidates Emporia with Greensville County, James City County with Williamsburg, and Fairfax City with the County. 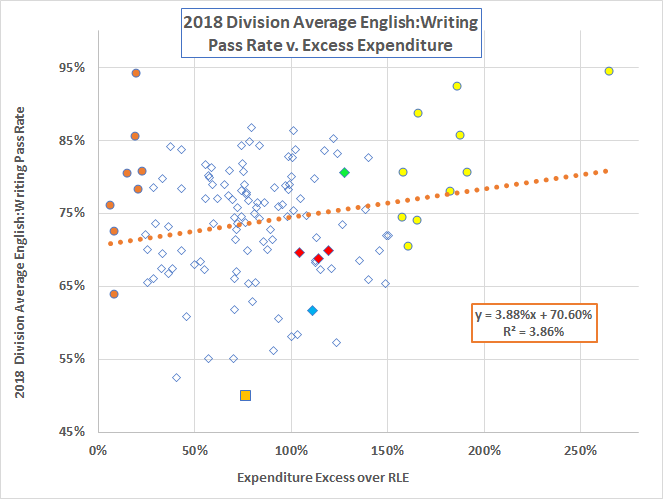 I’ve calculated those three consolidated RLE’s from the individual division data. 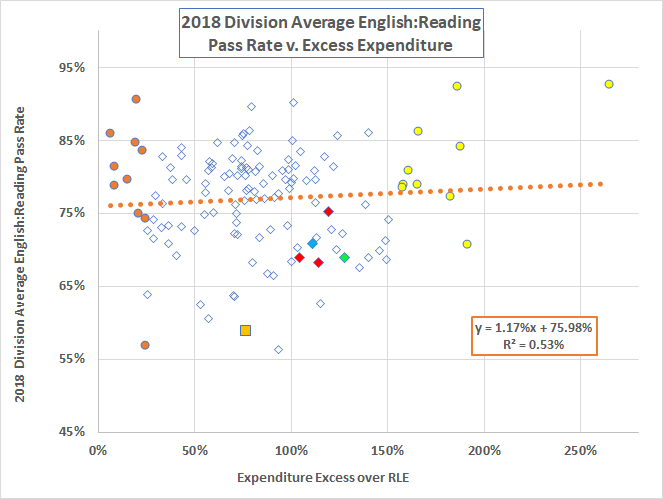 To start, here are the 2018 division reading pass rates plotted vs. the expenditures beyond the RLE. 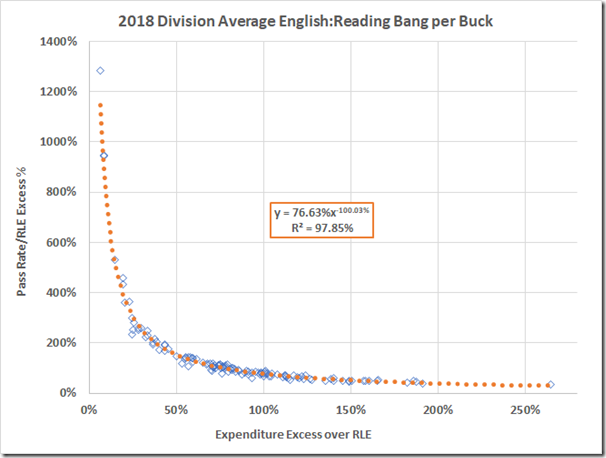 The slope of the fitted line would suggest that the average reading pass rate increases by 1.17% for a 100% increase in the excess RLE. The correlation, however, is minuscule. 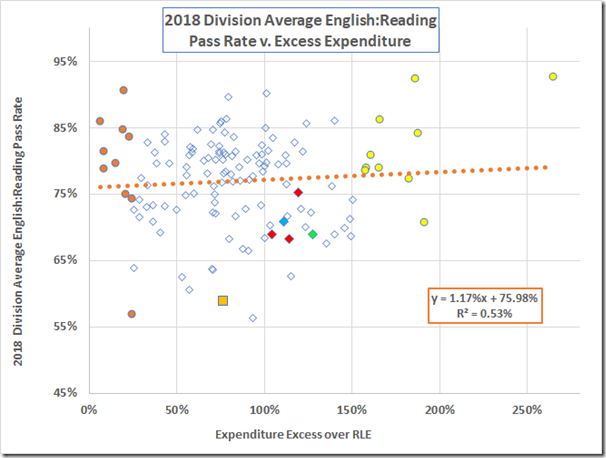 Translating the statistics-speak into English: The division excess expenditure does not predict the reading pass rate. 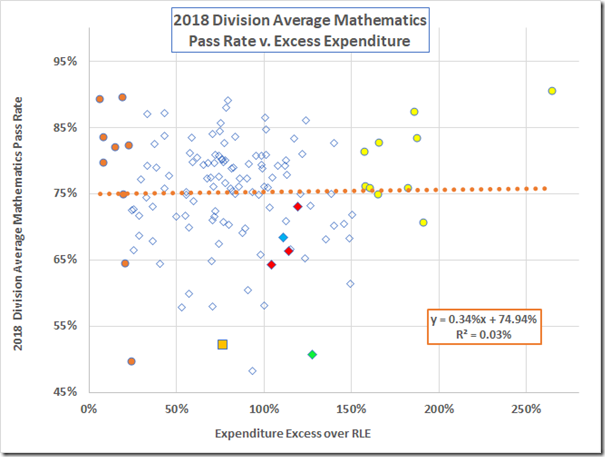 Richmond is the gold square on that graph. The peer cities are the red diamonds: From the left, Norfolk, Newport News, and Hampton. 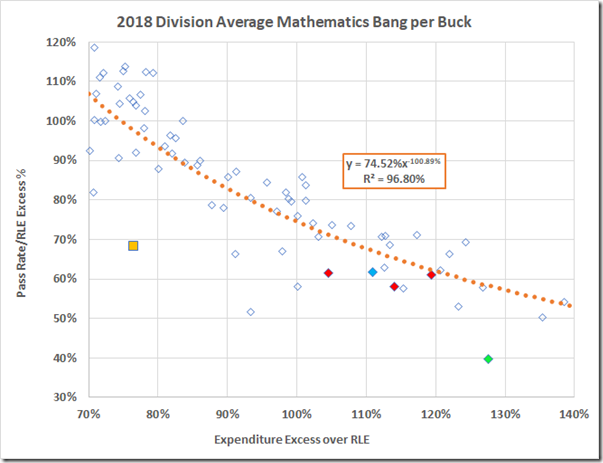 Charles City is the green diamond; Lynchburg, the blue. 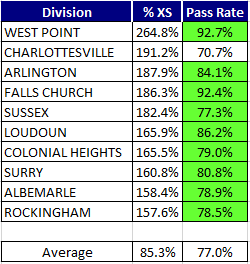 For the most part, those divisions performed well (green shading for those > the average). 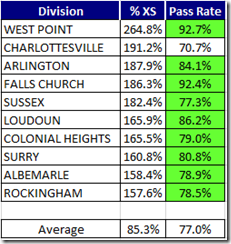 With the exception of Petersburg, those divisions also performed well, or close to it. 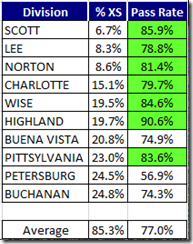 Notice that six of the ten are in Southwest Virginia and five of those performed quite well on the reading tests. BTW: Williamsburg had the lowest excess, 3.69%, but that datum disappears here into the average with James City County. 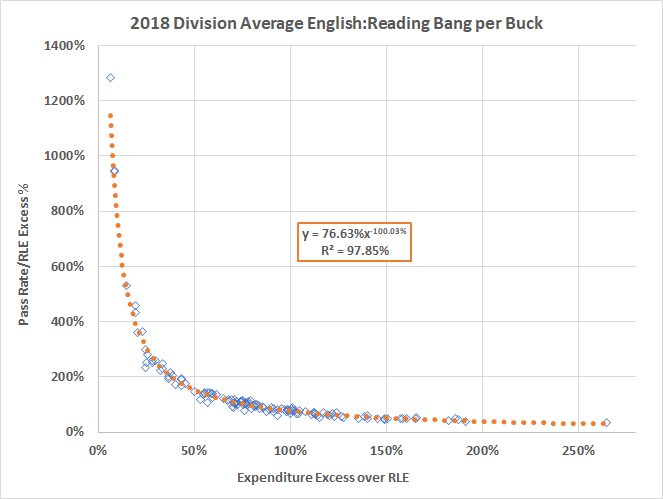 The Bang/Buck correlates well with the reciprocal of the Excess; no surprise there. 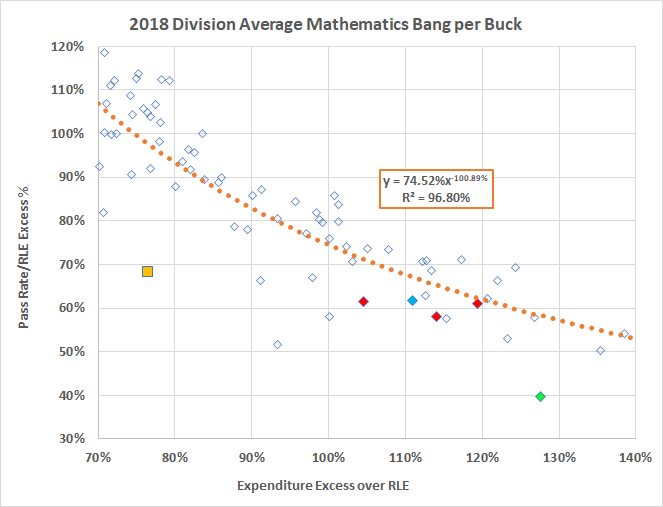 Looking just at the middle of the curve, we see the divisions of interest underperforming the fitted curve, Hampton only slightly. 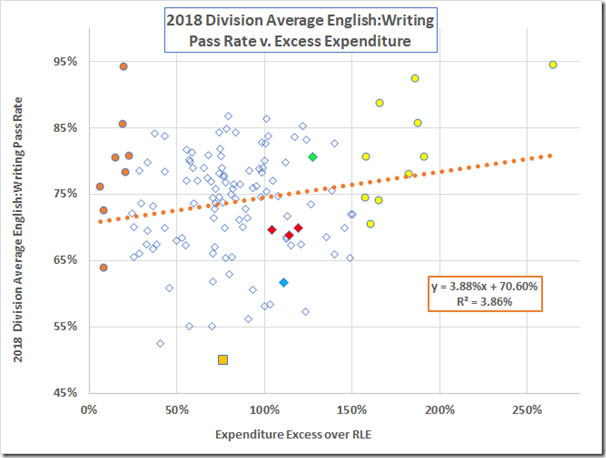 The data for the other subjects tell much the same story (albeit with a hint of a correlation in the writing data). 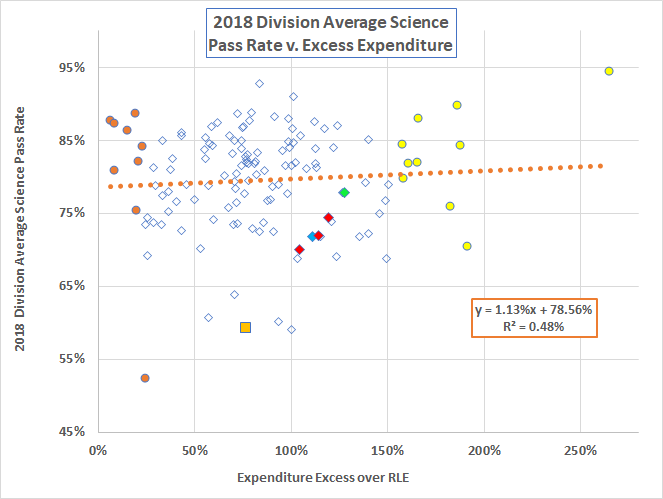 All that said, we know that “economically disadvantaged” students underperform their more affluent peers and that Richmond’s large population of ED students puts RPS at a disadvantage in terms of raw SOL pass rates. Indeed. Stay tuned for the next post.